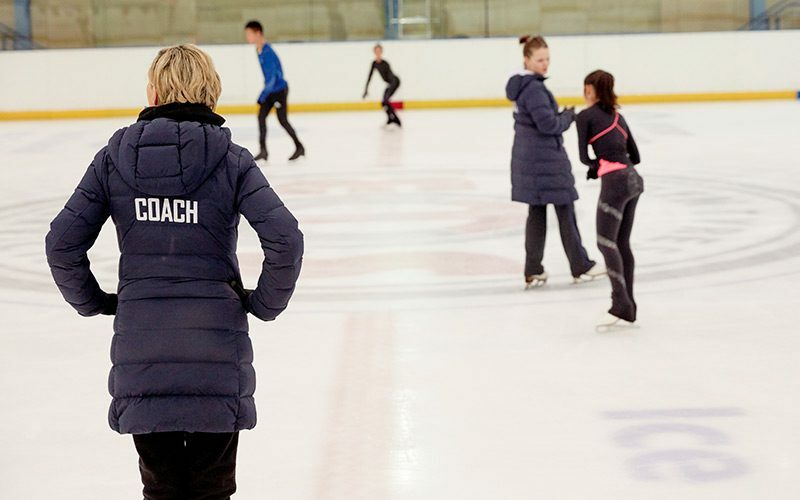 Our comprehensive programme includes intensive training of on ice and off ice skills tailored to the specific ice skating disciplines: singles figure skating, ice dance, synchronized skating. On ice sessions include a Footwork section that focuses on edge work, different steps, turns and body movements with the intention to progress towards the variety and complexity of the footwork needed to perform step sequences and transitions at a higher level. Plus a Technical on ice session that will be discipline dependent, so figure skaters will work on jump and spin technique, whilst ice dancers and synchronized skaters will focus on elements involving spins and step sequences/patterns. Off ice sessions include: warm ups recommended for skaters, specific off ice session tailored to the skater’s discipline (jump rotation, spin simulation, specific body positions), cool down and flexibility. Skaters will be allocated to a group based on numbers, age and standard of skating.